While using Microsoft Windows, I had a window that had somehow fallen completely off of my screen. 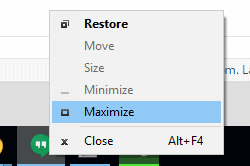 Right-clicking the window in the Taskbar and selecting Maximize brought it back, but there was no way I could get the window restored to where I could move it around my screen with my mouse. Luckily, there are a couple of ways to bring off-screen windows back to the desktop screen. Right-click a blank area of the Desktop, then choose “Display settings“. Select “Advanced display settings” at the bottom of the window. Temporarily change the “Resolution” to another value, then choose “Apply“. See if you can see the window on your screen now. Change the resolution back to the previous value, then select “OK“. Right-click a blank area of the Desktop, then choose “Screen Resolution“. 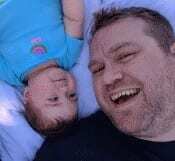 Hold down the Windows Key, then press “D“. Repeat these steps to see if it makes the window you are looking for reappear. Alternately, you can right-click a blank area of the taskbar, then choose “Show the desktop“, then repeat. Select the program in the task bar. Hold the Windows Key while pressing Left Arrow or Right Arrow repeatedly to move the window back into view. In Windows 10, 8, 7, and Vista, hold down the “Shift” key while right-clicking the program in the taskbar, then select “Move“. In Windows XP, right-click the item in the task-bar and select “Move“. 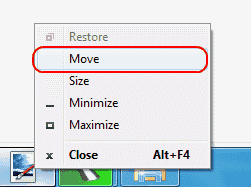 In some instances, you may have to select “Restore“, then go back and select “Move“. Use your mouse or the arrow keys on your keyboard to move the window back onto the screen. 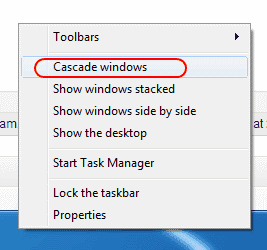 Right-click a blank area of the task-bar, then select “Cascade windows“. Sometimes a single app will get stuck in a state where it cannot redraw onto the Window. You can usually alleviate this by doing the following. 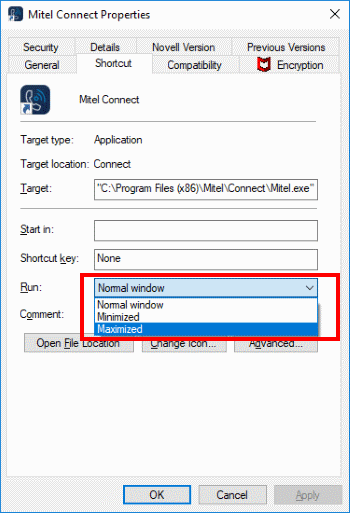 Hold “Shift” and right-click on the program icon in the taskbar, then choose “Maximize“. How do I prevent my application from starting off the screen every time I launch it? Most applications will stop doing this if you properly exit out of the application while it is on the screen. If you have already properly exited the application, you might need to uninstall and reinstall it. Otherwise, you can try right-clicking the icon for the application, then choosing “Properties“. Under the “Shortcut” tab, change the “Run” setting to “Maximized“, then select “OK“. You just saved my day. You are a wonderful human. Thanks! Fix 3 and 4 worked for me on Windows 10. Fix 6 was my last hope, and it worked! Thank you “Fix 3 – Move Option 1” worked wonders for me! Thank you! resolution worked for me!! Fix 3 for Windows 7 fixed it for me! THANK YOU SO MUCH! Thank you, thank YOU, THANK YOU for sharing this. Peace and love. It works! Is this more like going into a parallel dimension to bring back your window? I’d like to think so. Thanks. i accidentally moved the screen up but cannot find the same dialog box that moved it to reset it? Fix 4 worked for me, thanks! Thanks for the ALT+Space tip. I couldn’t get the Maximize option using anything else. The off-screen has been a constant pain for years and it was always way to fiddly to resolve. You have just shown me a tip that worked in seconds. Fantastic.